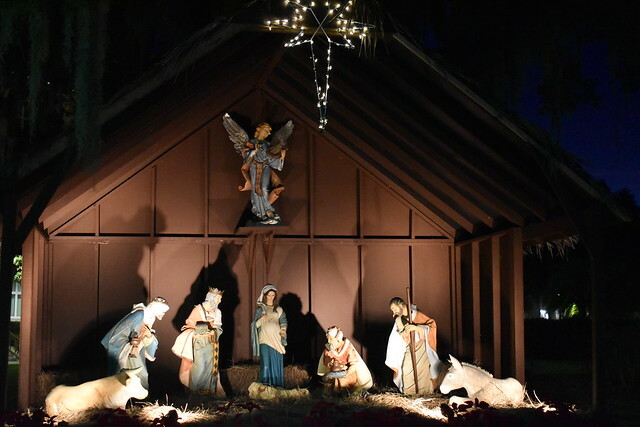 ST. LEO, FL – Saint Leo University kicked off the Christmas season at the university’s annual Christmas tree lighting ceremony at the main campus on November 27. “In those days a decree went out from Caesar Augustus that the whole world should be enrolled. This was the first enrollment, when Quirinius was governor of Syria. So all went to be enrolled, each to his own town. Smith blessed the Christmas tree and the university’s Nativity, leading the Saint Leo community in prayer as it prepared for Advent. Music was provided by students Olivia Callahan and Allie Losee and Dr. Cynthia Selph, director of the university’s music program. Lucas Nocera, music minister for University Ministry, played keyboard and led everyone in Christmas carols. On a chilly night, students, faculty, and staff enjoyed Christmas cookies and treats to cap the evening.